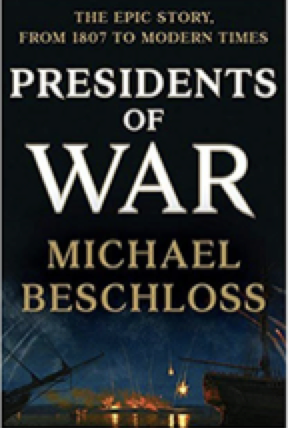 Michael Beschloss has written a highly readable, but deeply flawed account of our nation’s war-making presidents. The book follows the traditional, Euro-centric narrative of American history, emphasizing the noble motives of our 19th century Presidents and ignoring the major impact of African slavery and territorial expansion on our nation’s history. Becshloss may have written a bestseller, but he has missed an opportunity to educate readers about the importance of racism in forming our nation’s early foreign and domestic policies. An expert in the post-World War II era, Beschloss has written six books, including the riveting, May Day: Eisenhower and the U-2 Affair (1986). During this period of American struggle against communism, good and evil was clearly defined; so perhaps he can be excused from trying to tackle the complex and contentious issue of how African slavery shaped our American republic. In his preface, Beschloss states his book is about the eight presidents who took America to war and their “motivations…their struggles with Congress…and efforts they made to search for lessons from the American past.” But by turning a blind eye to racism of our early leaders (six of our first seven presidents were slaveholders), he has failed to break any new ground. Instead he succeeds in merely repackaging the now discredited vision of the unselfish, aristocratic Southern president, acting without self-interest to defend a young, freedom-loving democracy. Sven Beckert, Harvard history professor, has written that “a new consensus is emerging, one that treats slavery as the interstate highway system of the American past.” Between 1800 and 1860, the number of slaves in the United States jumped from 400,000 to 4 million. In Presidents of War, however, the reality of the slaveholding republic is basically ignored. It is treated like a small blemish in the corner of a magnificent portrait. Presidents of War begins with James Madison, whom the author portrays as a “man of straw’ easily manipulated by his predecessor, Thomas Jefferson. Madison, a short, thin man weighing barely 100 lbs. compensates for his diminutive appearance by wearing expensive clothes and riding around the capital in a luxurious carriage. A “hypochondriac” who was frequently ill, he is easily out-maneuvered by the wily, British diplomats and stumbles into the disastrous War of 1812. Beschloss skips over the next war president, Andrew Jackson and instead highlights the cunning James Polk. A veteran Tennessee congressman, Polk owned a large plantation in Mississippi and bought and actively sold slaves while in the White House. This crime is overlooked in favor of depicting Polk as a “charmless wheeler-dealer” who skillfully bypassed Congress to start a war with Mexico. Beschloss omits any discussion of the implications of the vast expansion of slaveholding territory that resulted from the war. The first stirrings of the abolitionist movement and the introduction of the Wilmot Proviso are relegated to a short paragraph. The author avoids any discussion of the presidency of Andrew Jackson. This is a major omission in any book that claims to deal with the war presidents. Jackson, of course, was the most famous general of his era and a popular president who presided over a major expansion of executive power. He also waged a series of wars against the Southeastern Indian tribes, which resulted in the death or forced removal of some 50,000 Native Americans. Their removal freed up fast new lands for a rapid expansion of slavery. Instead, Beschloss jumps from 1848 to April 1861. In chronicling the outbreak of the Civil War, he begins with a scene of the newly elected Abraham Lincoln struggling with how to respond to the siege of Fort Sumter. He shows the anguished Lincoln dealing with his cabinet of outspoken, veteran politicians. He leaves out any discussion of the historic events preceding the siege at Charleston. The book avoids any mention of Frederic Douglass, the abolition movement, the Kansas-Nebraska Act and the formation of the Confederacy. The impact of slavery on American national identity is finally addressed in Chapter 7 with a discussion of the Emancipation Proclamation. This decision, which impacted four million enslaved African Americans, is treated as a simple political decision by a president concerned about re-election. Knowing the proclamation would be controversial, Lincoln decides he can only make it official only after a major victory by the Union Army. In the second half of the book, which deals with the Spanish-American War of 1898 and the wars of the 20th century, Beschloss is on more familiar ground. He uses his considerable narrative skills to craft a compelling story about modern American presidents struggling to steer American foreign policy in a tumultuous world. By 1900 America has emerged as one of the most powerful nations on earth at a time when technological advances in killing (e.g. machine guns, artillery, radio) made warfare deadlier and more unpredictable. Both Woodrow Wilson and Franklin Roosevelt campaigned on the promise that they would keep American boys from fighting in foreign wars. Yet both wound up reversing themselves and leading the nation into costly world wars. The author’s exhaustive search of presidential archives hit pay dirt when he found recently declassified reports on the Vietnam War. In a disturbing revelation, he reports that William Westmoreland, the top American commander, secretly initiated a plan to move tactical nuclear weapons into Vietnam in early 1968. The secret program, code-named Fracture Jaw, would have positioned atomic bombs on ships ready to use by local commanders in the defense of Khe Sanh, a major American base. Walt Rostow, LBJ’s national security advisor, learned of the plan and warned the president, who immediately cancelled it and rebuked Westmoreland. This is interesting speculation, but is it the most important lesson to draw from 250 years of presidential history? No nuclear war, thank God, has taken place. Yet our nation continues to suffer from the impact of a century of African slavery and discredited white racist thinking. By failing to address this aspect of our nation’s history, Beschloss has written a commercially successful, but one-dimensional view of the American presidency.